The Multimedia Extreme high density media storage system from EDP Europe provides high density media tape storage in a minimum foot print area. The Multimedia Extreme system consists of base units and optional sliders for increased storage capacity. 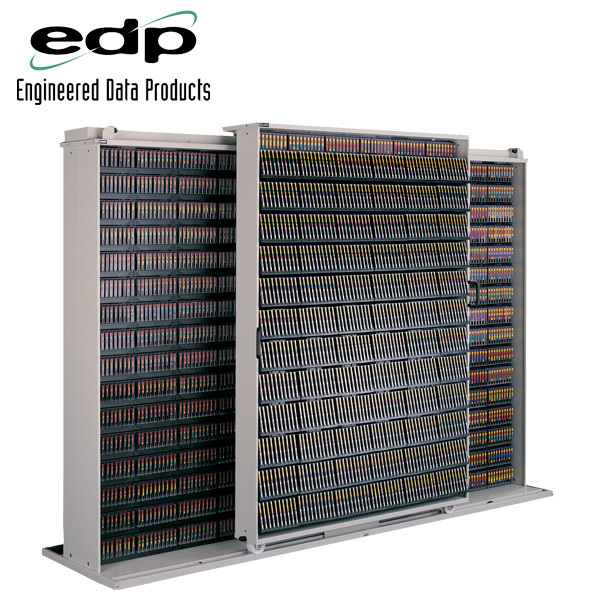 The Multimedia Extreme high density media storage system, from EDP Europe, provides high density storage for various formats of media tapes in a minimum foot print area. 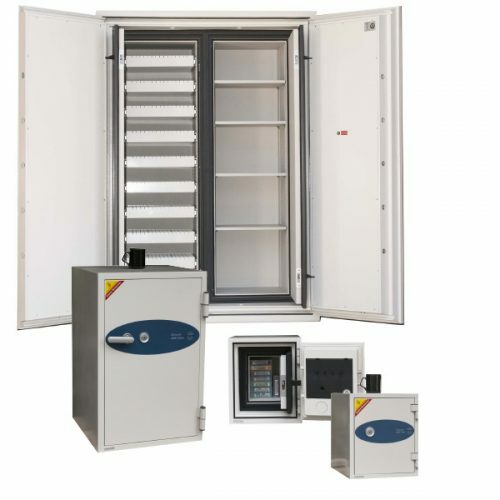 The Multimedia Extreme system consists of base units and optional sliders for increased storage capacity. The Multimedia Extreme media storage system can be configured to store a single media type or a mix of different types of media in the same rack via specially designed, media-specific storage pacs. 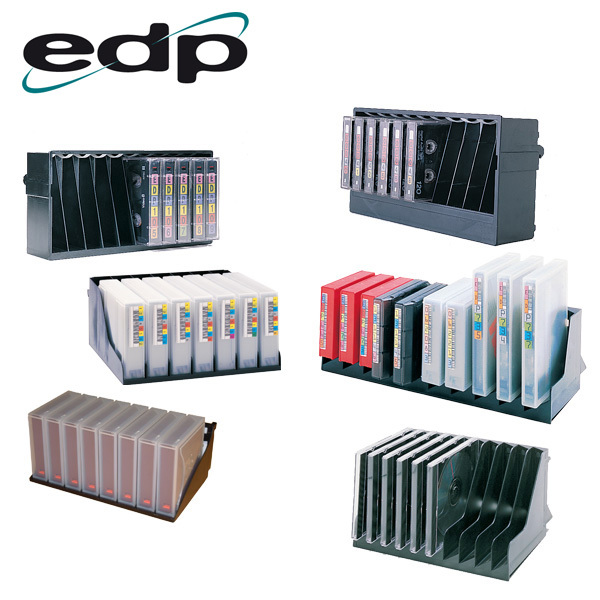 With over 500 million cartridges stored in EDP Extreme Density media storage systems, EDP is the leading media storage provider worldwide and EDP’s tradition of innovative design assures the smoothest, most reliable operation possible. As the need for more storage capacity arises additional slider units can be added to the base racks, increasing media storage capacity by up to 80%. Optimal storage flexibility is available through a variety of removable and interchangeable, injection moulded Pacs. Pacs hold between 7 and 12 cartridges, depending on media type, in individual slots to prevent damage and provide a flexible and durable, space-efficient system. The pacs attach to evenly spaced slots in the uprights allowing for a mix of media pacs in the same rack. 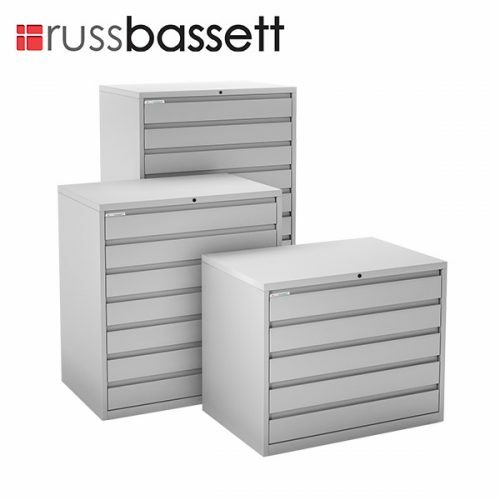 Start with base racks, which can be ganged together, and increase capacity with optional slider units. Available in single-sided format for attaching to a wall or in double-sided format for creating aisles. Base units are 6 pacs wide, and between 8 and 16 pacs high, depending on the media being stored. Slider units are fitted with Delrin® wheels for easy, quiet movement. The standard spring-assisted brake system allows for smooth, easy operation and has adjustable tension for operator preference. An optional hydraulic brake system is also available. The slider becomes neutral at the end of a row. As a result there is no drag and the slider can be moved back in the opposite direction without any resistance.